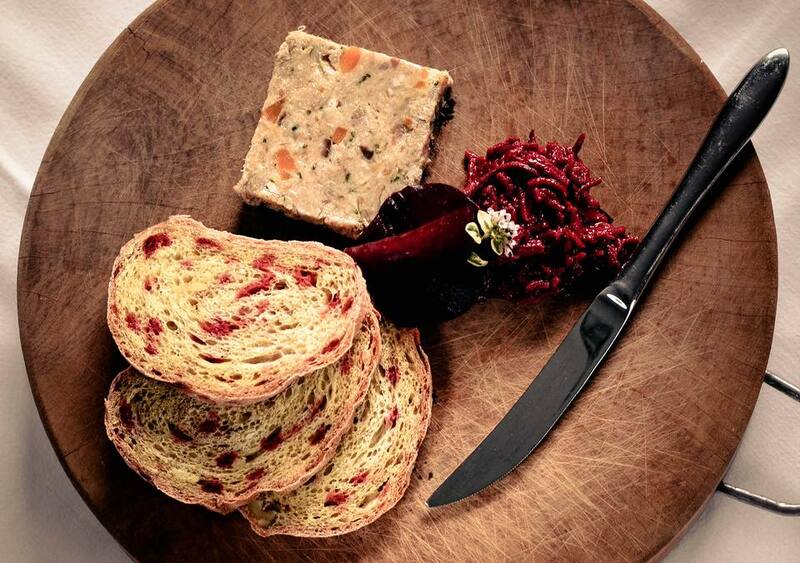 Pheasant & Apple Terrine is one of those amazing culinary matches, the meaty flavours and belly pork in the terrine are beautifully offset with the crisp, sweet apple in the mixture. Added to this, the quick and easy to make beetroot bread adds to these combinations turning it into a sublime piece of cooking. Bone the pheasant, if you are unsure how to do this, then ask your butcher to do this for you. Coarsely chop the breast meat and place in a mixing bowl with remaining flesh from the pheasant. Cut the belly pork & pork fat into small dice, then add to the pheasant meat. Add the grated apple, the chopped onion and the crushed garlic to the mix. Season well. Pour in the glass of cider in and leave to marinate for one hour. Place the terrine mixture into the blender and whizz until coarsely minced, do not over blend or the meat will turn to a paste. Check the seasoning. To do this, take a small piece of the mixture and pat into a small burger shape, then fry in a hot frying pan and taste to see if you like the seasoning. Line a 13cm x 30 cm ovenproof terrine with the strip of bacon leaving a good overhang at the top. Fill the terrine with the pheasant mixture and fresh firmly to make sure there are no gaps. Fold over the bacon and the top, and cover with a lid or two layers of foil. Place the terrine in the oven for one hour. To test if the terrine is cooked, pierce with a skewer, and if the juices released from the terrine run clear, the terrine is cooked. If not, cook a little longer but be careful not to overcook. Place the flour and salt into a medium bowl and mix well. Peel & grate the washed beetroot and add to the flour. Add the yeast & the water. Knead to create a smooth dough. Bake in an oven preheated to 200C/400F/Gas 6 oven for 35 minutes. This recipe comes from renowned Chef Lionel Strub, who is Chef Patron of The Clarendon at Hebden in the Yorkshire Dales. Originally Lionel comes from Alsace in North East France but he has lived in Yorkshire for over 25 years. Lionel is also Chef-Tutor at Cooks the Carlton School of Food.